Ten level episode replacement for first episode of Hell on Earth. Combat These levels contain a wide variety of combat situations requiring different strategies. To win these levels, especially at the more difficult skill settings, requires thinking in terms of fields of fire, looking out for your flanks and backside, and keeping open lines of retreat. Most of the monster placement is randomized so that their location and response are different each time these levels are played. Hence, you will be unable to count on finding specific monsters at specific locations. The monsters occasionally show sneaky behavior due to features in the level designs. 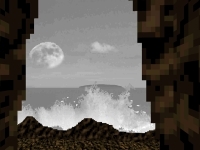 Setting: This episode is set on a rocky coastline. with spectacular outdoor views. These include high vistas and overlooks, live surf crashing onto the rocks, scenic elevator rides on the outside of tall buildings, and a spectacular bridge crossing the canyon in THE CHASM level. General: Secrets generally have some clue that the thoughtful and observant player can spot. These levels are designed to be winnable at the easier skill settings without finding the secrets, but to win the more difficult settings requires locating most of the secrets. There are no totally hidden hazards or traps; there will always be some visual or audio cue to warn of there presence. Some of the pools and slime pits have depth, ie, you will sink into them, sometimes up to your eyeballs. One final note; cliff edges at most of the high vistas are lethal to fall off of (one cannot expect to survive a fall of several hundred feet in real life). 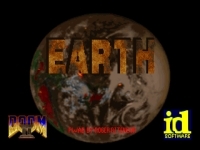 Earth (Doom II WAD) 1997 NEWEST!